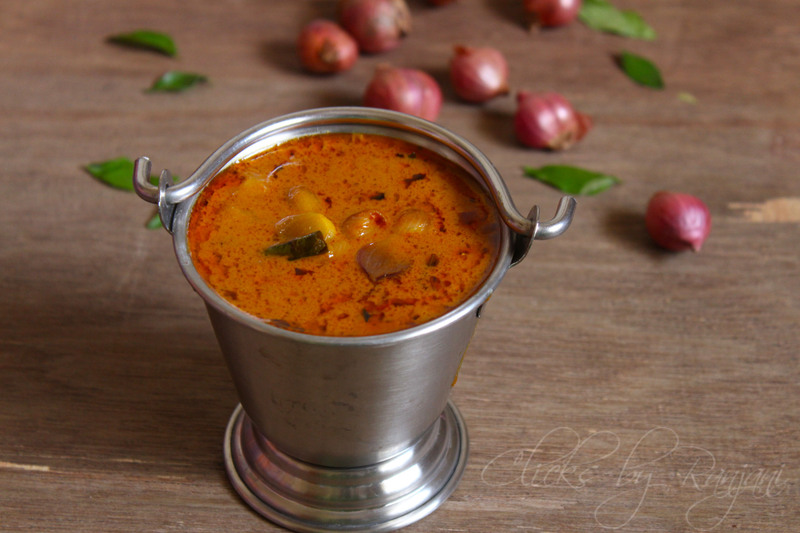 Vengaya Kuzhambhu recipe – shallots cooked in coconut milk. 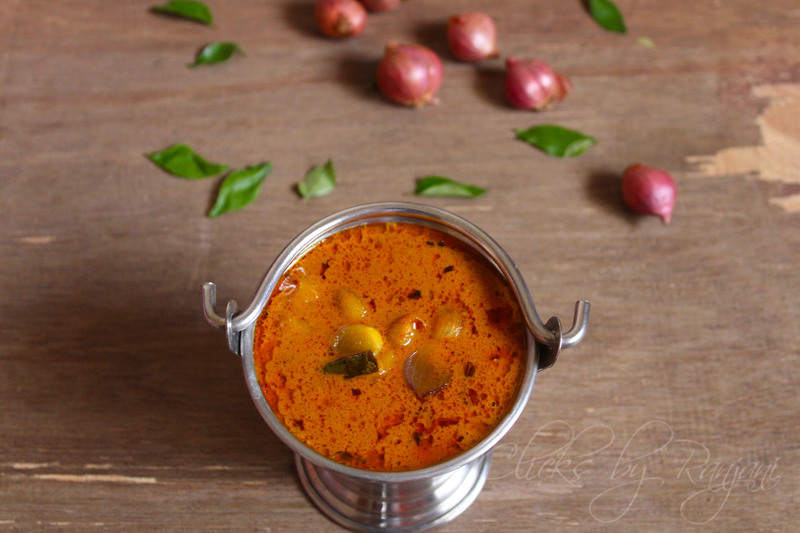 This tangy kuzhambhu pair well with steam hot rice, idli or dosa. You can keep this gravy for 3 days if refrigerated. I used to cook in gingelly oil only and I add more oil to preserve this for 3dayd. If you do so, this kuzhambhu will remain good for at least 2 days. Soak tamarind in 1 cup of hot water for 10 mins. Squeeze well and extract the pulp. Heat a kadai, add oil, once heated, add mustard, jeera, and fenugreek. Once the ingredients start to splutter, add shallots and curry leaves. Saute well till the shallots turns transparent. Add finely chopped tomatoes to it and cook well till the tomatoes become mushy. Add kuzhambhu milk thool (red chili powder) to it and give a nice mix. Keep the flame low while doing this to avoid burning. Add tamarind pulp along with a cup of water and mix well. Add coconut milk to it , once it starts boiling, add hing and cook till it becomes medium thick and oil starts floating on top. Please see stepwise pictures below. Heat a pan, add oil and season with mustard, jeera seeds, and fenugreek seeds. Then add onions and curry leaves , saute till the onion becomes transparent. Add tomatoes to it and cook till it becomes mushy. Add kuzhambhu milagi thool and stir well in low flame. Add tamarind water to it and mix well. Add coconut milk to it and allow to cook until it becomes semi thick and oil starts to seperate.